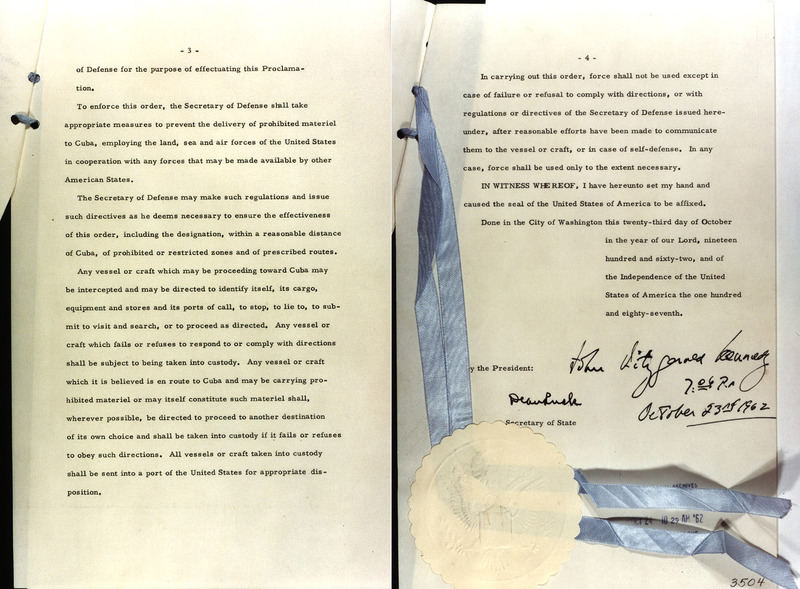 Assistant Secretary of State for Inter-American Affairs Edwin Martin seeks a resolution of support from the Organization of American States. Ambassador to the United Nations Adlai Stevenson lays the matter before the U.N. Security Council. 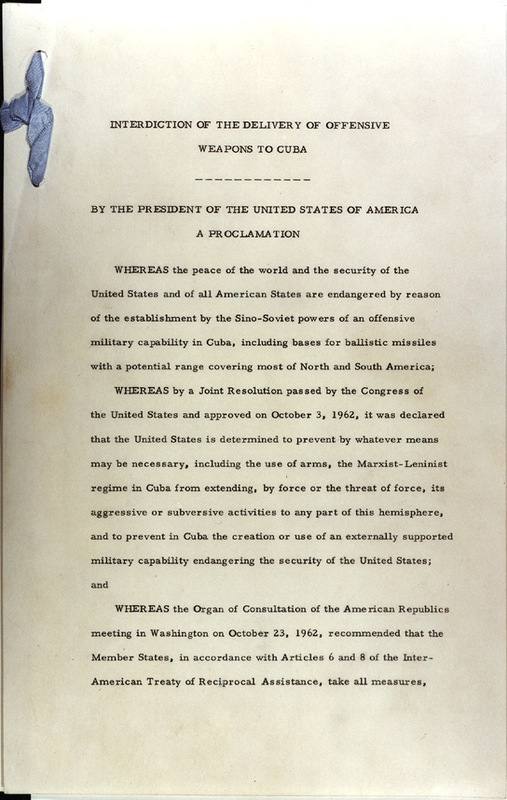 The ships of the naval quarantine fleet move into place around Cuba. Soviet submarines threaten the quarantine by moving into the Caribbean area. Soviet freighters bound for Cuba with military supplies stop dead in the water, but the oil tanker Bucharest continues towards Cuba. In the evening Robert Kennedy meets with Ambassador Dobrynin at the Soviet Embassy. 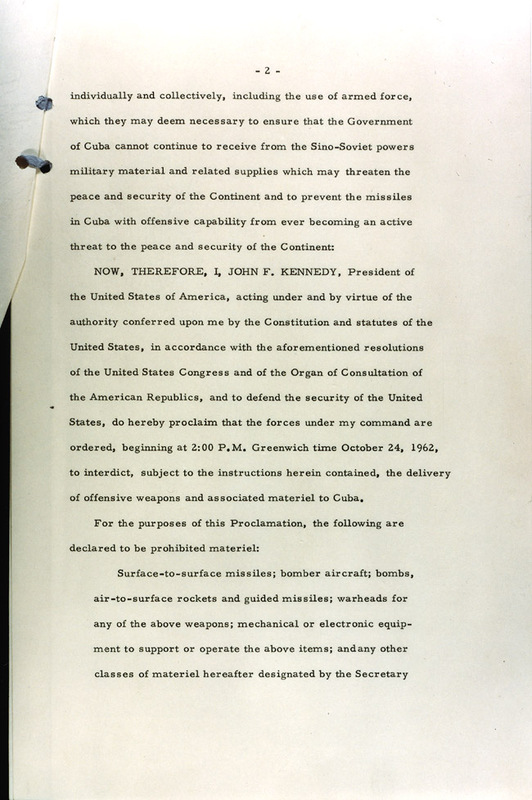 Original copy of Proclamation 3504, signed by President Kennedy on October 23, 1962, authorizing the US Naval quarantine of Cuba, courtesy National Archive and Records Administration. 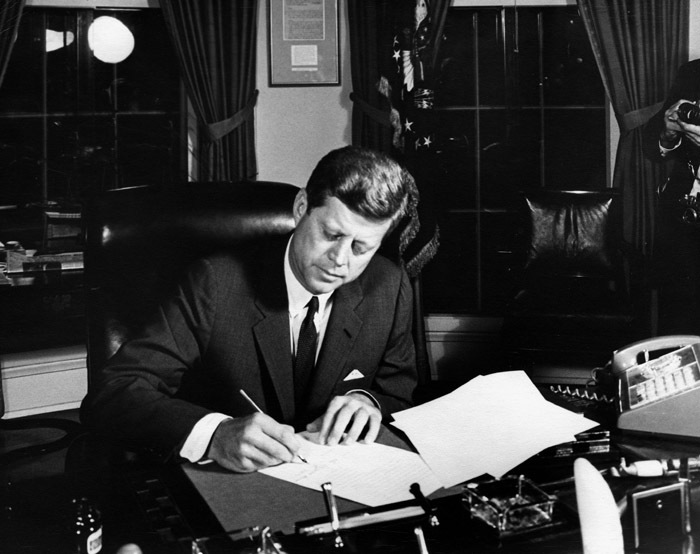 After the Organization of American States endorsed the quarantine, President Kennedy asks Khrushchev to halt any Russian ships heading toward Cuba. The president's greatest concern is that a US Navy vessel would otherwise be forced to fire upon a Russian vessel, possibly igniting war between the superpowers. 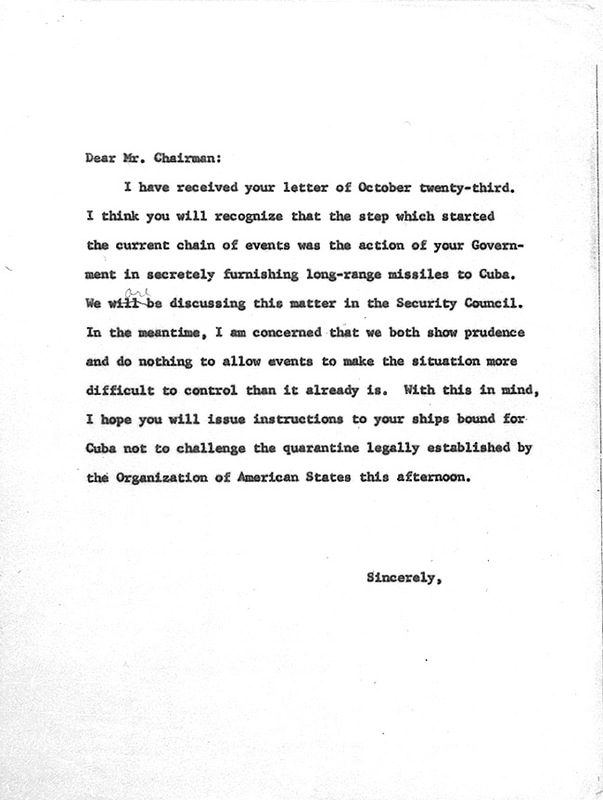 Kennedy's letter to Khrushchev asking him to halt Russian ships heading for Cuba. 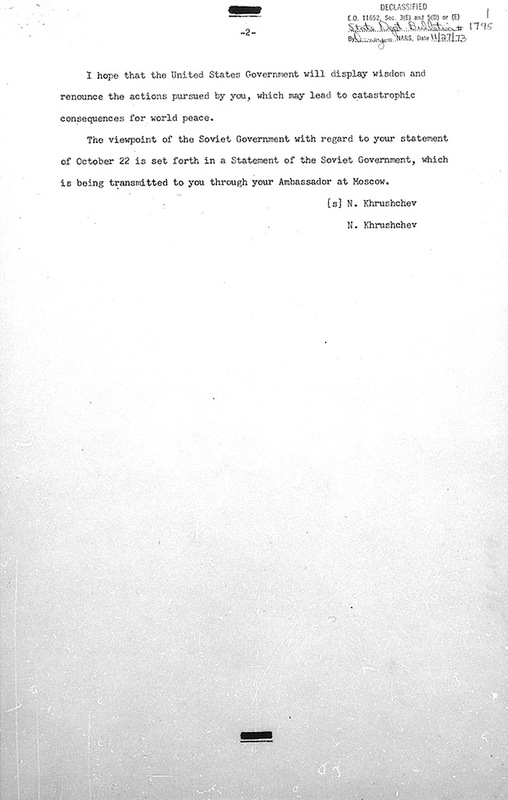 Page 1 of Chairman Krushchev's response to President Kennedy's Address. 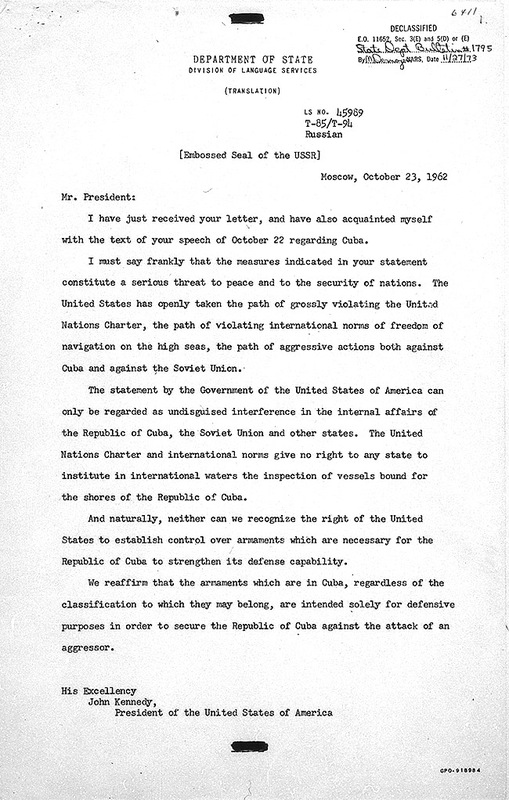 Page 2 of Chairman Krushchev's response to President Kennedy's Address.